This day is full of new sights, new surprises. Today I felt the foreignness of Nepal as I have not before. 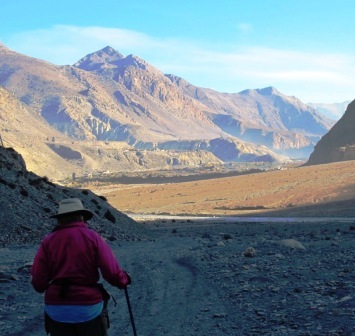 We have left the Hindu lowlands behind, and are now in the area settled a decade ago or more by Tibetan refugees. There is no lush greenery, no fertile croplands or orchards, only the austere high desert surrounded by snowy mountains whose remoteness only adds to the austerity. 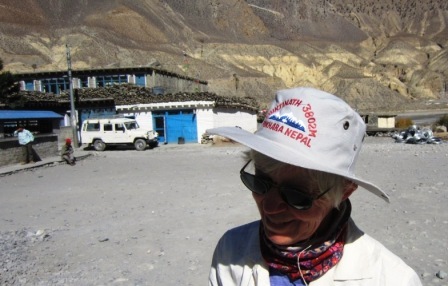 This morning as we leave town Bima, our head guide, spots a Multinath/Pokhara/Nepal twin of my wind-snatched Monterey Kayak hat hanging in a window – now I am equipped again! When we get to Jomsom DB again wants to take a jeep for the next leg up the hill . Hearing of the gray, rocky, dry, dusty, flat hike ahead to Kagbeni, DM and I wimped out and agreed to join her on the jeep. In fact, a certain amount of bravery is required to get into one of these 4-wheeled engines of doom; we careen along at probably a top speed of 30 mph but it feels like 70, dodging weary trekkers, donkey caravans, motor scooters, and one very large bus, which brings muffled shrieks from DB in the front seat. We only ford a few streams, only come perilously close to the edge of the eroded road once or twice, and it is only 45 minutes. 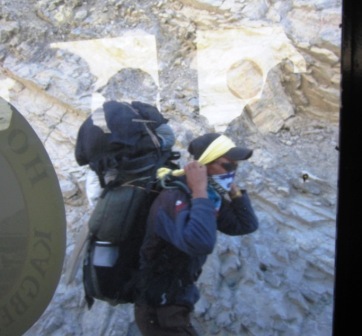 The hikers we pass look every bit as unhappy as we feared we would have been, scarved against our dust, bent under their burdens, squinting as we pass. Kagbeni offers a lovely guest house in a very old Tibetan style village; We enjoy lunch on the sunporch and then spend the afternoon exploring the village. 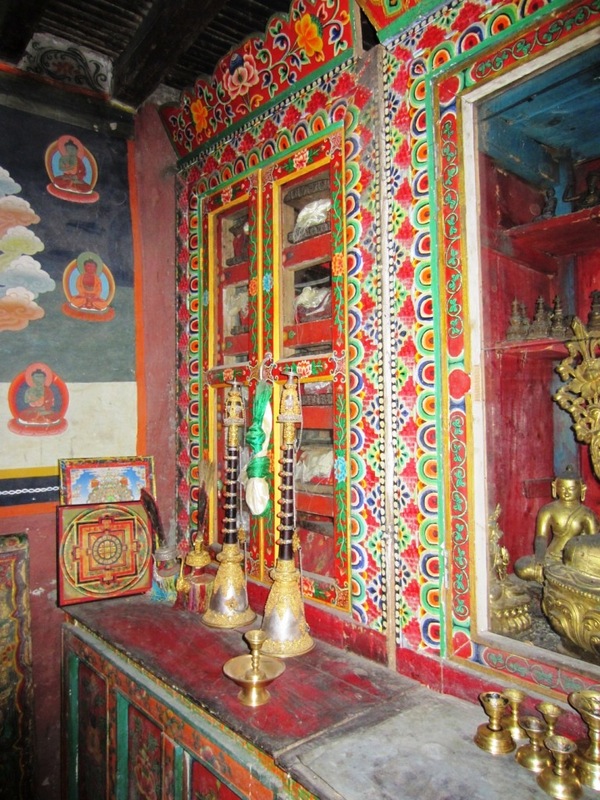 We visit the gaily painted Buddhist monastery which dates back to 749 AD, and has marvelous murals, mandalas, carved and painted pillars, and all sorts of ritual objects, including ancient scrolls kept under lock and key, intricate marzipan figurines made as sacrificial offerings, conch shells from who knows what distant ocean used on ceremonial occasions, and countless statues and portraits of Buddhas and Bhodisattvas. The Wheel of Life at the top of this post shows humans progressing toward heaven or hell (was Breughel influenced by Tibetan Buddists? Hell looks truly horrible! 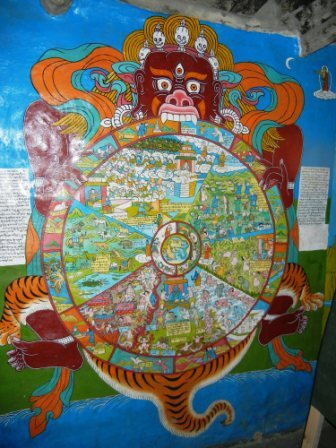 ), but the entire Wheel is threatened by the God of Death ready to destroy the entire cosmos. 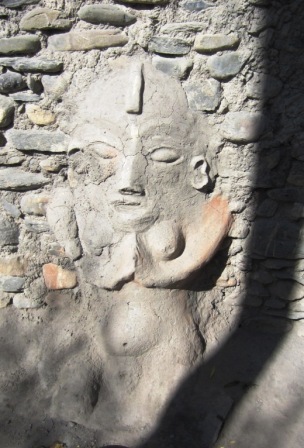 We also admire the graphically male and female effigies of the village gods who protected the village before Buddhism arrived. who is also endowed with genuine yak fur mustache and eyebrows, real teeth, a painted cloak and belt, and a real metal knife. 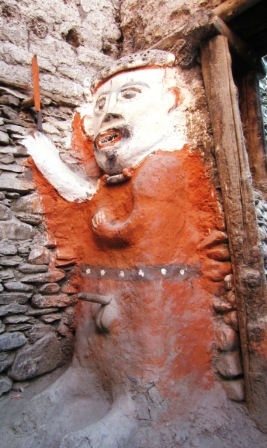 The female effigy is about half the size of the male, and gets no paint or fur embellishment. In the evening we all sit around a big table with a bunch of Germans and one Dutch girl enjoying the charcoal brazier warming our feet under the table, with our down jackets keeping us warm above the table, reluctant to leave in fear of the cold distance between charcoal brazier and sleeping bag. Despite the differences in languages and nationality around the table, we feel closer to these Europeans in outlook than to the folks who created and maintain both the village guardians and the Wheel of Life. This just made me soooooo nostalgic for Nepal. Kagneni’s my fav. Thanks for sharing! !